MISSION: The protection and safeguard of North American and all of its citizens by whatever means necessary to succeed in the mission. One life is one too many. JURISDICTION: This agency operates wherever necessary to protect North America and its citizens. ALLIES: None officially as other agencies are unaware of NACID’s existence. Other nations Special Forces and intelligence organizations have reported mysterious assistance on some missions but believe that other allied agencies are involved. OPPOSITION: Anyone that threatens North America, even allies will be engaged if their missions endanger the US and/or Canada. The North American Combined Intelligence Directorate rose from the ashes of the North American Security Service or NASS in the wake of the first attack on the World Trade Center on 26 Feb 1993. NASS was originally responsibly was to safeguard the North American continent from unconventional threats. During this time, NASS had limited success and was plagued by difficulties with inter-bureau conflicts, juridical difficulties and an unresponsive administration. During the weeks building up to 9/11, NASS was investigating an assassination attempt against the Vice President; and through the course of the investigation discovered that the agency had been compromised and was being fed false information. While NASS administration met an official investigation, the infamous attack had already begun. Critics inside the National Security Council claimed, with no real evidence, that the NASS had been used as a tool by the terrorists to distract, other Federal agencies allowing the attack to succeed. It quickly became apparent in the days after 9/11 that NASS was going to serve as the intelligence scapegoat for the event, and was quickly, and quietly disbanded. With the panic of the ensuing days after the attack various and the state of heightened alert, the National Security Council meet with President of the United States, and the Canadian Prime Minister and outlined the concept for a centralized intelligence network, and the North American Combined Intelligence Directorate was born. A small group of Canadian and American politicians were made aware of the program, individuals who secretly sponsored the agency. The project was funded through covert or “Black” projects from both military and domestic budget allotments. Whereas NASS was a public security agency, open to investigation, and known in both intelligence and government circles, NACID is purely covert ops and answers to the President and Prime Minister only. Agents and personnel were recruited from the American FBI, CIA, and NSA and from the varied branches of the United States armed forces; from Canada, the RCMP, CSIS, CSE and the military intelligence community as well. Both nations also provided members of their Special Forces and counter terrorist forces to act, as the new agency’s muscle should the need ever arise. NACID is organized into cells, but are able to easily share information with each other via the encrypted computer and communication networks. The cells are able to operate independently, and are able to carry out the goals of the agency as they see fit. Due to individual’s cells autonomy granted by the agencies structure, NACID does provide mandated policies to ensure that the cells do function as an effective organization. Upon its formation NACID immediately began to gather intelligence and investigate the tragedy, utilizing resources developed by NASS, and new assets provided by its formation. NACID also sent out strike teams to punish all those responsible it could find. NACID operatives were amongst the first on the ground, and its strike teams also provided valuable intelligence for the US led Coalitions strikes on Afghanistan. The current chairman is Warren Jacobs, a 30 yr veteran of the RCMP and a former director of CSIS. The deputy chairman is Colonel Sylvia Rosenthal of the United States DIA. It is the Directorate’s policy to have both a civilian and military member as with chairman or deputy chairman and one from each nation. The Agency answers to the President and Prime Minister only and for the most part the governments of both countries are unaware that NACID exists. NACID is responsible to detect and eliminate any potential and existing threats to the US and Canada where ever they exist throughout the world. Other nations are aware that North America has a new agency but have been unable to find out much information about it. NACID is being intentionally secretive as it preserve its security and because it might have or has already conducted illegal operations on allied soil. NACID has been extensively involved in The War on Terrorism and has been credited with preventing 3 more attacks on North America, including a nerve gas attack in San Francisco Bay. It is also believed NACID has “retired” several suspected and high-ranking Al Quedia and Taliban officials. NACID also participates in sweeps against internal enemies as well. The mysterious elimination of several militia’s and drug gangs seems to indicate that NACID considers this to be threats against North America as well. NACID uses the standard Departmental Format as found in the Spycraft Corebook. It also uses 3 teams that can be found in any department. Bonus feat: Any Combat feat, must meet the prerequisites. Organized in teams of 7, 6 assault and 1 driver/sniper. Assault Team comprised of the following. Team Leader with MP5 variant, Doorman with assault shotgun (see table below) and demolitions kit, Grenadier with C8/M4/G36C with grenade launcher, Communications (long range) with MP5 variant, Medic with MP5 variant, Rope master (rappeller) with MP5 variant, and the Taxi Man (driver/sniper) with sniper rifle of choice (see following table). +1 bonus to Spot and Hide checks and every 4 levels thereafter. Bonus feat: any Unarmed feat, must meet the prerequisites. Organized in teams of 4 using all manner of surveillance gear that is mission specific. All team members carry MP5K PDWs for self-defense purposes only. CORT agents are also involved in protection details and often are working frontline with other agencies, usually under false credentials. As a result the CORT teams usually have several cover identities and supportive documents. Bonus feat: any two-Gear feats, must meet all prerequisites. Organized in teams of 4. They are Expert hackers and proficient in all manner of electronic support. COES supplies the technical support and are deployed to assist with electronic and long range surveillance, target assessments, and sabotage to name a few mission specifics. COES agents are the ones that follow the money trails and generate the false documentation and credentials. Each C-Team is assigned a Handler, whose function is to guide a team during its mission. A Handler uses two-way radios to update the Team on any changing situation. The Handler can update his/her C-Team with data from real time satellite imagery, the latest intelligence or even from hacked surveillance equipment. A Handler can be found in a parked van across the street, an AWACS at 35, 000 ft or in a control room a continent away. A Handler can be a mixed boon for a C-Team because it gives both strength and weakness for the team and it could mean the difference between success and failure. Handlers are armed with Sterling MK7A4s for self-defense. +1 Department bonus to Will saves. This bonus increases by +1 at 4th level and every 4 levels thereafter. +1 bonus to Search and Surveillance checks. This bonus increases by +1 at 4th level and every 4 levels thereafter. Bonus Feat- any Basic or Gear Feat (must meet all prerequisites). When all of the C-Teams are brought together they form a Covert Operations Group (COG). A COG is a permanent or static formation with personnel being replaced or transferred due to normal attrition and for administration reasons. Personnel assigned to a COG are instructed in the culture and language of the country they are assigned to. A COG team is deployed to theaters that are deemed as high interest or high risk by D-0. C-Team composition can vary greatly depended on area of operation as well as the needs of the mission. 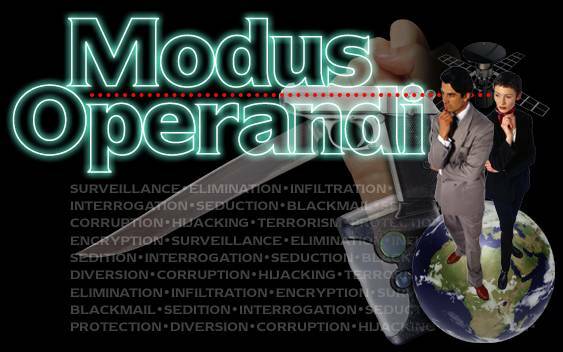 It is not unusual for operatives outside of NACID to be brought in on particular cases, but this requires the formation of a sold cover for the operation. NACID cells follow a simple organization, and are highly independent and capable of operating for long periods away from a centralized command. Leadership of the cell is usually appointed through an almost democratic processes within the group. His authority is not unquestionable, and while this method appears unorthodox, it provides a series of checks and balances against a cell leader “crossing the line”. NACID C-Teams also vary in task and form to meet different objectives, composed of a multitude of different specialists to specialized cells dedicated to a particular pursuit. The former are more typically associated with technician and support facilities within NACID, and provide support to the agency as a whole rather than an individual cell. Communications between cells is facilitated through advance encryption programs and posting to various internet bulletin boards. Cell leaders can meet for debriefings and courier passes. NACID and the NSA also have a working relationship, which prevents NACID communications from ending up in the daily briefings of a half-dozen intelligence agencies. Knowledge of NACID has been kept compartmentalized to the upper levels of government and before additional personal are briefed on the program, several checks are performed on their reliability and background. Continuous hunt for Bin Laden, al Queda, and other international terrorist networks. The assassination of an Israeli Mossad agent upon her discovery of NACIDs headquarters. The rescue of an AC-130 crew shot down over Afghanistan. Recovery of nuclear material from the port of Vancouver. Safe houses are extensively stocked with food, weapons, clothing, fake identification and other supplies needed to help an agent that has gone to ground or is waiting for his/her next assignment. Most agents make it a policy never to use the same safe house again. As well, the differing departments in NACID have been known to set up their own safe houses unbeknownst to the rest of the agency. These carbine versions of the M16A2/C7 series assault rifles that are in service with the United States and Canadian militaries. The M4A1 and C8 have proven to be dependable weapons finding a niche in the Special Operations community as well as some regular military units. The M4A1 and C8 are virtually identical with the differences being sight set up and minor cosmetic changes. The Ithaca Stakeout is modified to be concealable from the popular and dependable Ithaca Model 37 found in police departments North America wide. It is designed to be worn under a coat or jacket, hanging from the shoulder by a special harness that can bring this shotgun into action quickly. The slide can be modified for a fold down handgrip or a loop so as to prevent the hand from slipping in front of the muzzle whilst firing. The Sterling MK7A4 is a machine pistol of the venerable and ever reliable Sterling L2A3. The MK7A4 is capable of semi and full auto fire and can be fitted with a special shoulder holster. This weapon was originally designed for vehicle and aircrews but has found a niche in the Special Operations community and with several mercenary firms such as Executive Outcomes. The Basement: cell phone, laptop, street wear, minimag lite, multi tool, Sig Sauer P226 9mm, 3 magazines, shoulder holster.